LOTTOCELL.PH: PCSO Bingo Milyonaryo on LottoCell Mobile App for Android Now Loads LottoCell Wallet with GCASH! PCSO LottoCell Mobile App now features playing PCSO BingoMilyonaryo plus the capacity to load up your LottoCell wallet via Globe GCASH! Lotto Cell Mobile App is currently the only lottery gaming application endorsed by Philippine Charity Sweepstakes Office and is readily available for free via an Android device. This partnership with Globe Telecoms with its GCASH top-up definitely amps up the gaming public on getting their bets on without the hassle of lining-up to lotto booths. 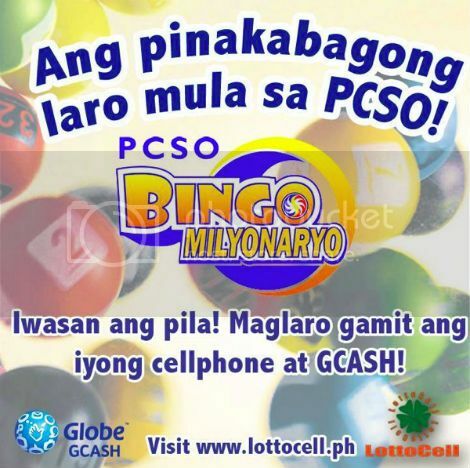 As of now, the LottoCell App only offers the PCSO Bingo Milyonaryo game. Though it still has lots of “Coming Soon” icons that fill the gaming options. We don’t know yet if 2D, 3D, 4D and 6D Lotto will get into the app, or even the GrandLotto, MegaLotto and SuperLotto makes it to the mobile platform. The mechanics of playing the PCSO Bingo Milyonaryo is just the same with the mobile app, and the prices of the tickets as well. On how to use the LottoCell Android App and on how to use GCASH to load your LottoCell wallet, just refer to the instructions below. Download the LottoCell Mobile App for Android. After the download, put the apk file in your microSD. You can choose to create a folder and rename it as “apk files” for convenience if you like. Then just tap it to install on your Android phone. To Login, enter your Username and Password, then tap the “Sign In” button. Tap on the PCSO Bingo Milyonaryo icon. Afterwards, you can choose the game you want to play. Mark your desired numbers by tapping the numbers on the screen. Review your chosen number combination, number of draws, system play and the amount. Tap on “Buy Ticket” when you are ready to purchase the ticket and continue. If purchase was successful, you will see the confirmation message with the Draw Date, your number combination, the Confirmation Number and the transaction QR Code. Download Globe GCASH Mobile App via Google Play Store. Enter all the required info, click “Resister” and wait for an SMS confirmation. If you already have a GCASH and a positive balance on it, you can proceed to Step 3. Transfer funds from your bank account via online bank transfer, mobile banking by dialing *119# for BPI, via BancNet ATMs, or walk through any of the GCASH outlets near you. Launch the LottoCell Mobile App and sign in. Select the Menu button, then choose Reload. Tap on GCASH, enter the amount you desire to load, then select Reload via GCASH. Click OK, exit the LottoCell Mobile App, and wait for an SMS from 2882. Reply to the SMS with your MPIN within 5 minutes. Now, go to your LottoCell Mobile App to check your LottoCell wallet balance. LottoCell Mobile App is only available through Android smartphones and compatible with at least version Android 2.2. Take note though, that this one’s only available in the Philippines. You can access the app via Wi-Fi or 3G, or even transact via SMS. You can also buy an electronic top-up card from an authorized dealer or online merchant to load up your LottoCell account automatically if you prefer it than GCASH. For more info and technical support, just drop an email at support@lottocell.ph.